Whether you’re ordering delivery or dining in, Cumberland Restaurant offers fine Cantonese cuisine for the whole family. Stop in for lunch or dinner, or call us for speedy delivery. We also feature a delicious Saturday and Sunday dim sum brunch—stay into the evening for a drink. We have banquet facilities to accommodate larger groups and convenient parking. Please call ahead for groups larger than eight. Experience Cantonese cuisine in an authentic atmosphere and exceptional service every time you dine. We guarantee the exceptional quality of our food and service, as well as reasonably priced dishes made with only the freshest ingredients. 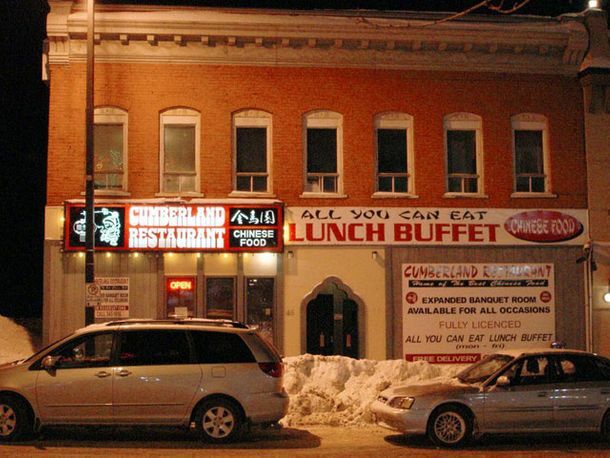 Customers agree--Cumberland Restaurant serves the best Chinese food in downtown Thunder Bay!